Considered by many to be the world’s greatest chess player, Bobby Fischer personified the link between genius and madness. His trajectory propelled him from child prodigy to world chess champion at age 29 and then into a nosedive of delusions and paranoia. Fischer was a recluse for decades before resurfacing for a bizarre final chapter as a fugitive. As a loner with no familial support, Fischer had to defend his title while representing his country against the mighty Russians during the cold war. The center of media attention, Fischer was never equipped for a life in the spotlight. 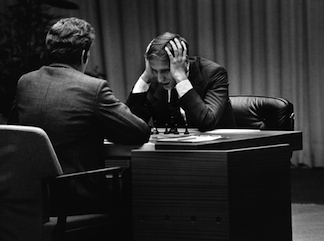 From veteran filmmaker Liz Garbus, and the final project of late editor Karen Schmeer, Bobby Fischer Against the World exposes the disturbingly high price Fischer paid to achieve his legendary success and the resulting toll it took on his psyche. Rare archival footage and insightful interviews with those closest to him expand this captivating story of a mastermind’s tumultuous rise—and fall.